WOW LARGE BLOCK & STYLISH 4 BRM HOME!!! Welcome to Bella… we are proud to offer you this fabulous Home to be built on a super large block in the popular Highland Reserve estate. 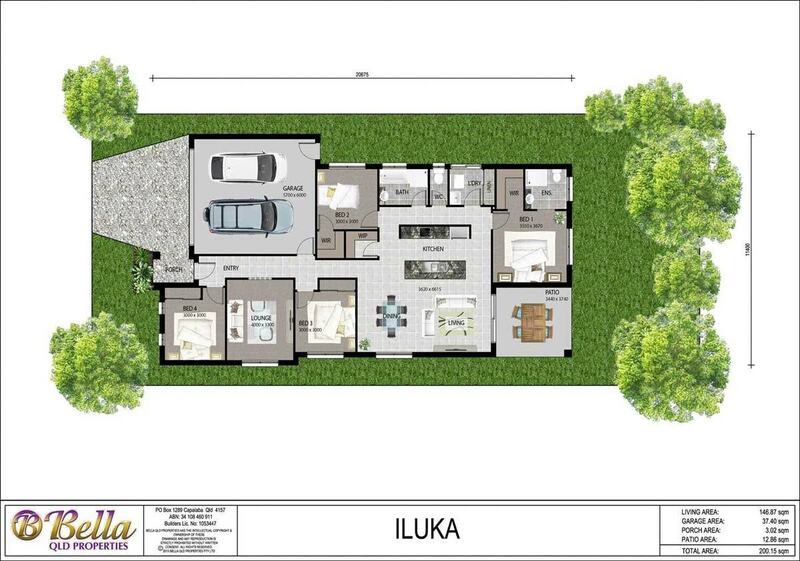 Our ILUKA home boasts 4 generous bedrooms, spacious open plan living, as well as a separate Lounge area, modern gourmet kitchen with Roman Stone tops & stainless steel appliances; and an outdoor entertainment patio for alfresco dining! This home is one you can enjoy without breaking the bank and has all you need completed with Bellaâ€™s Freedom Inclusions (worth $22,500) and quality finishes that stand out. Deal directly with the builder and experience our personalized friendly customer service. LAND IS SELLING FAST SO YOU MUST BE QUICK! For the best outcome, Heather Daymond invites you to visit our display Home at 39 Hans St, UPPER COOMERA to see the quality of our finished homes and you can personalise your design & inclusions according to your lifestyle. â€¢	Quality fixtures and fittings, plus many more outstanding features. â€¢	$15,000 1st Home Owners Grant may help to make this home a reality! Bella QLD Properties Ltd is a boutique master builder and our homes are constructed to the highest standard. Being a family owned company we actually care about you and your investment. Highland Reserve is a tranquil community situated at the foothills of Mount Tambourine and its immediate surrounding area offers an impressive entry lake, walking & cycling trails, BMX track, childrenâ€™s playgrounds, local schools, shops, tennis courts, BBQ facilities & transport facilities. Surrounded by plenty of bush reserves & great outlooks. It is ideally located only 20 minutes from Surfers Paradise and 40 minutes from Brisbane CBD. CALL HEATHER; 0450 558 915 or email: sales5@bellaqldproperties.com.au for an obligation free discussion and estimation of this house and land package or similar package in your preferred area. *Terms & Conditions Apply. This Home has not been constructed and is subject to Land Availability. House price subject to site specific, soils test, contours, final site investigation and head office approval. Facade upgrades will incur additional cost. Any Bushfire or Acoustic Protection will incur additional cost. Should any changes occur to the First Home Owners Grant this will affect pricing. Photography and illustrations are to be used as a guide only.